Pando: What's the state of LinkedIn's economic graph? It has taken some time for LinkedIn to have a rich news feed, but I’ve found that in 2014 when I share links to news stories on Twitter, Facebook and LinkedIn, the most activity comes from LinkedIn. I’ve got roughly the same-sized network on Twitter (people who interest me) as Linkedin (people I’ve met) and a smaller set of connections on Facebook (people who are or were close to me). I know what you’re thinking. Many view LinkedIn as an online resume or address book, and only interact by viewing transactions that happen on your network like who’s connected or who’s viewed my profile. But a ton of time is spent on viewing LinkedIn at my company, and I work in media. What if your company blocks Facebook and Twitter at work like those of you at banks and law firms? I wondered what are the peak hours for LinkedIn versus Facebook and Twitter and what is the state of the economic graph? We love 3rd party content and that was one of the reasons we acquired Pulse. It brought a lot of high quality content from 3rd party publishers onto LinkedIn. We’re still finding ways to use this high quality and relevant content to help our members be better at the jobs that they are in. Pulse displayed content users specifically sought out (i.e. I'm interested in reading Wall St. Journal content, so I select to read it in the onboarding process) or top news (based on views and shares) in certain categories (everything from business to gaming). So, for those interested in topics with a heavy readership, the crowd would curate the news for them. Now, in 2014, you have this strange situation. All of the new product tinkering from Facebook and Twitter looks like they are copying what LinkedIn Pulse has built and LinkedIn has integrated into its updates, where news from 3rd parties is front and center. Facebook Paper, and Twitter’s shift to rich media cards API and their soon to be upsetting redesign are looking a lot more like LinkedIn. Maybe this frenzied activity from Facebook and Twitter is to ensure they don't slink into the valley of the blahs. Or maybe there’s a great convergence in the way news will be consumed. Then people will seamlessly switch from one network to the next based on the context of where they are, like being at home, or at work, lunch or in transit. One thing that can't be denied. Reid Hoffman LinkedIn's founder and early investor in Facebook, was early to understand the concept of a newsfeed, and he was prescient on how putting reading material on social networks was going to be a very important part of the social experience. Hoffman once said, "Seeing what someone’s reading is like seeing the first derivative of their thinking." If I had to characterize the evolution of LinkedIn from a lurking network into a curious, content-consuming culture I'd say it comes from its differentiation in the social space. What we do on LinkedIn should be called ‘Reiding’ or reading with the intent to understand the people, companies and news related to improving your professional life. The killer Facebook app I want automatically deletes any posts that include Buzzfeed, Upworthy, Viralnova & Co.
Jonah Peretti explained to Business Insider why Facebook hasn’t yet crushed it by suggesting that Buzzfeed has found a way to be relevant to Facebook as 1990s MTV was to '90s cable companies. That could be a great opportunity to publishers on LinkedIn or it could just be Buzzfeed’s hope to be spared. It seems to me that LinkedIn has figured out to make it even easier for publishers to be relevant on their platform without a lot of weird gaming. In fact LinkedIn has led the way by being more selective in it’s attempt to become the ‘definitive professional publishing platform’. For example, in Reid Hoffman’s PandoMonthly he laughed about a Zynga board discussion (51:45-52:03) when he said he would never let Marc Pincus put games on LinkedIn. But that’s not to say that LinkedIn updates are not in disarray, nor are they a joy to consume yet. The other thing Reid Hoffman said in that clip was it was a really big deal getting photos on LinkedIn profiles, and maybe generic photos, in their unstructured format should not be given the priority they have. When I look at LinkedIn updates, roughly a quarter of what I see in the feed are new and improved, boring profile pics from my connections. These are not Instagram photos that we want to see, these photos smell of desperation, just as the slight title enhancements to LinkedIn profiles do. Any change to your profile triggers a broadcast update, ‘person x is now an advisor to such and such company’ is shown to everyone, and yet there’s no nice way to turn those updates off, not even the viewer can do that without hiding all updates from that person. Linkedin Updates = Your Identity (Content surfaced based on your Job Title + Industry + Followed Companies + Followed Influencers + Pulse Content Channel Preferences) + Network Connection Transactions (Profile photo changes + Connections made + Endorsements + New Jobs & Promotions) + Shared Content (LinkedIn’s Curation Team’s Posts + Shares of content from Network Connections + Highly Engaged Posts from outside your network). If you really look, in the above formula you can see that LinkedIn curates, so LinkedIn is actually a Platisher (social platform + media publisher) such that some of the content you see is unique to your feed. Yet some of it is put there by LinkedIn's editorial team, which is an organization that Twitter and Facebook do not have. You can also see that beyond all the transactions and evergreen content from fascinating influencers like Richard Branson, there is user generated content. User generated sharing of news, but also user generated photos, shared or interacted with from your network or worse, from outside of your network. I thought I had pestered LinkedIn’s PR enough already, but I had to ask what they thought of these sorts of pictures and they said they had never seen them. Nicole Leverich did say "the content that drives high engagement is more likely to get surfaced to more members." 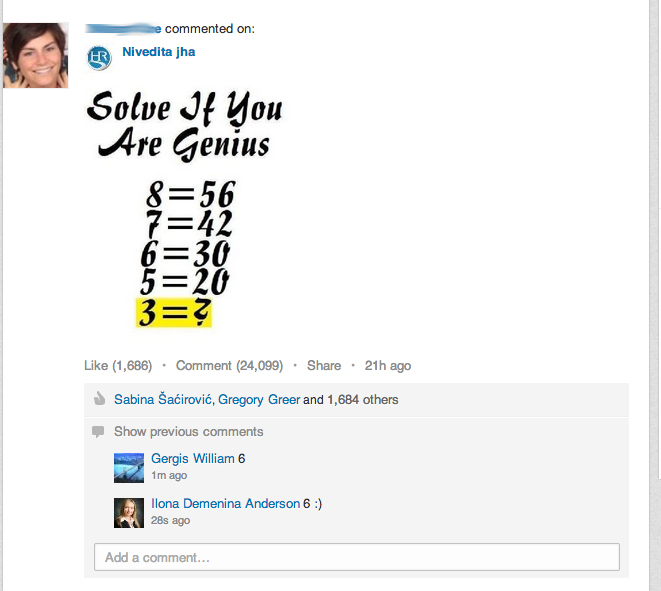 So, if these brainteaser images are über-engaging, the unsuspecting people, or people who were inclined to answer because they wanted to look smart on Linkedin and answered these math questions, are going to pop up in your newsfeed. Crystal Braswell, Manager of Corporate Communications at LinkedIn, mentioned that “my network has changed a lot since I first joined LinkedIn, and I have removed lots of connections over time." Maybe that’s why I was seeing these posts but she was not. Although I’ve done my best to keep my contacts on LinkedIn limited people I’ve somehow met, LinkedIn explicitly warns against connecting to random strangers. Then again LinkedIn has put in the work to make sure we can connect all of our address books and suggest connecting with all of the people in there whether or not you’ve actually emailed them, which prompted this suggestion from Christina Desmarais at Inc., to just connect with everyone. Porous networks and perverted pictures aside, I am a big fan of how LinkedIn has integrated more rich media content via its APIs, specifically the Slideshare integration. I see the ability to post slides from your presentations as the second big step after the acquisition of Pulse and the introduction of news sharing. LinkedIn is now moving away from the LinkedIn of 2005-2010 that was simply a resume and sales tool where users are stalking connections and job updates, to a LinkedIn as a content marketing hub, after learning from it's past failures with LinkedIn Answers and Groups. Moreover, the question remains: Does any social network have a reason to integrate a 3rd party API for content that provides value-add to users other than LinkedIn?